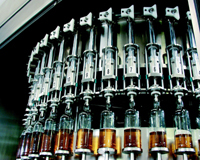 The Gravity filler would typically be used for free flowing still products such as water, juices etc. A key feature of the gravity filler is the separated air return. This ensures that the air expelled from the container does not enter the filling bowl and potentially contaminate the product. Rather it is evacuated through a separate manifold to ensure it does not come into contact with the product. Fill level is decided by the vent tube. The valve was designed in conjunction with some of the major bottled water suppliers. Advantages of this valve include no dripping from the valves and a greater fill level accuracy. A vacuum systems assists with the fill rate and can be operated as a gravity filler if required. Products filled with this type of valve include juices, spirits and wines. The low vacuum valve can also be used for both hot juice filling and cold juice filling especially useful when a multi product line is planned. 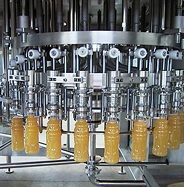 These are selected when we are filling solids and particulates such as fruit dice in suspension or fruit sacs or high viscosity products such as tomato paste and other similar products. The principle of operations can also be used for vegetable and detergent filling as well. – PET Bottle handling with a special non change part neck handling system without an infeed wormscrew. We have experience of filling many type of products ranging from water to soy sauce to edible oil so are sure to be able to meet your needs in this field.